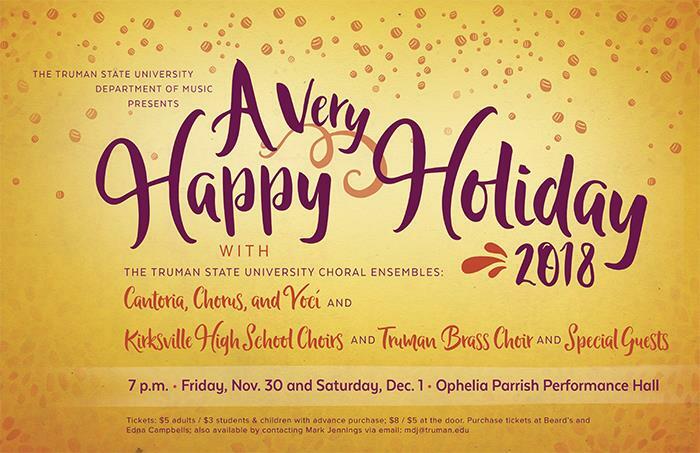 The University choirs, the brass choir and Kirksville High School choirs will come together to perform a joint concert, “A Very Happy Holiday,” at 7 p.m. Nov. 30 and Dec. 1 in Ophelia Parrish Performance Hall. Tickets are $5 each for adults and $3 for children and students until Nov. 27. They are available for purchase in downtown Kirksville at Edna Campbells and Beard’s Decorating Center starting Nov. 5. Tickets will also be available at the door the night of the performances.